Ideas, and the ways in which they are expressed, are at the center of political discussion and debate. 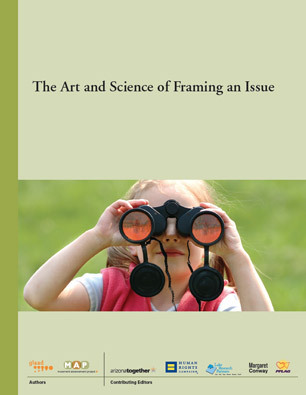 The Art and Science of Framing an Issue offers a general overview of how people’s existing worldviews shape their reactions to information and rhetoric—and how effective framing can help people understand and form connections with issues through the lenses of their own values and beliefs. Movement Advancement Project and GLAAD. January 2008. The Art and Science of Framing an Issue. http://www.lgbtmap.org/art-and-science-of-framing-an-issue (date of access).